Oh that shiny yellow star. I can just see it gleaming elusively in the landscape as I desperately try to catch it. 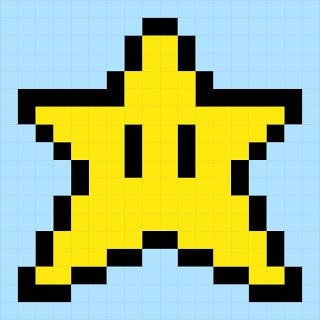 To know that for a brief period of time my Mario would become invincible and fast, destroying all the enemies all the way. Plus there is that cool color changing flashy thing he does and that music that increases your anxiety with each second warning you that your power will soon run out. Good times. Once again, I’m blown away by YOUR serious creativity! Check out the BACK (can you believe this is the back?!) 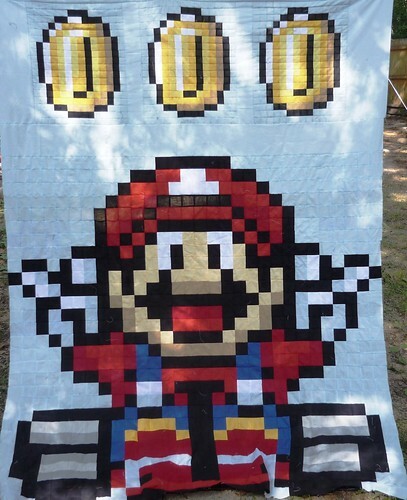 of Simone of Local Honey Crafts’ Mario Quilt. She created a huge Mario Kart Mario complete with gold coins. Can we say awesome?! I come here for inspiration and eye candy and I always get it. HI, there! Long time, no chat! I do love your star block. And that is a crazy cool Mario Kart! Hi there. I am new to your blog, but I just want to say how excited I am about this quilt! I found it about two weeks ago and just got the materials yesterday and today. Thanks for what you do!! Found this link via Pinterest; thank you so much for making the grids available for personal use! My 8 yr old is going to love this quilt when I get it finished! !